A Canadian model has experienced partial sight loss after a procedure to permanently colour the white of her eye purple went wrong. 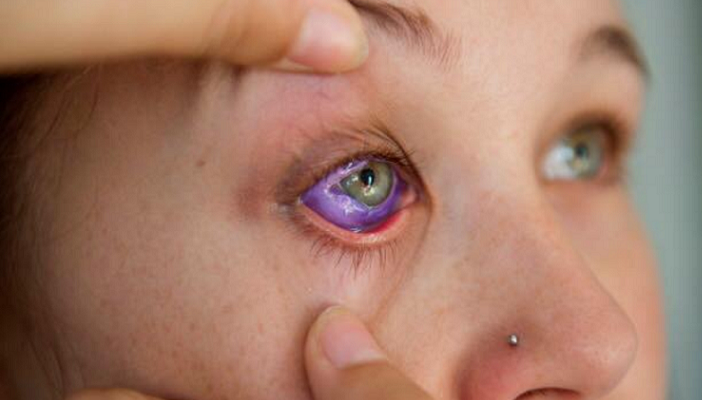 While undergoing the cosmetic procedure, known as a scelera tattoo or eye ‘staining’, Catt Gallinger’s eye started to seep with purple fluid. Gallinger was rushed to hospital and given antibiotic drops, but a week later, the drops had left the eye swollen and her vision was blurred. Gallinger then tried steroid drops, but the drops caused the purple substance to clump around the cornea. Hospital staff informed Gallinger that she may never fully recover and her eye might even need to be removed. However, in a recent video posted on her Facebook page, Gallinger explained the drops she’d been trying had helped and she had regained her sight fully. Doctors who treated her suspect the equipment used for the procedure may not have been entirely sterile and therefore could have caused an infection. Gallinger is now using Facebook to tell her story and encourage others not to have a scelera tattoo. “There needs to be regulations and laws made. You [modification artists] should be forced to have proper surgical training if you wish to perform surgical procedures. The real issue is the lack of education, the idea that someone without a university education and many years of medical backup would understand the anatomy is outrageous."